Looking for the best time to visit New Braunfels in Central Texas? Founded in 1854, New Braunfels is one of the most authentic German-American communities in the country. 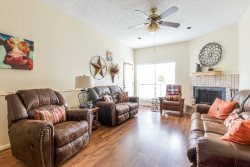 New Braunfels Resorts offer luxurious vacation rentals in Texas Hills Country located between San Antonio and Austin. This destination attracts travelers looking for activities for the whole family, as well as time in the great outdoors. Our team at New Braunfels Resorts compiled the following travel tips to help you determine the best time of year to plan your next trip to Central Texas. One of the best times to visit Texas Hills Country is in the shoulder season from late March to early May when temperatures are less intense. Seasonal wildflowers are in full bloom this time of year and peak in late April. You’ll also find cookoffs, festivals and regional Texan events in spring. Outdoor activities such as fishing, bird watching, and hiking are also ideal due to the pleasant whether typically in the 70s and 80s. Warm weather clothes are a must this time of year. Bring a rain jacket or purchase an umbrella once you get to New Braunfels since rain is also common in Spring. News Braunfels in the summer is ideal for river activities and water parks to beat the heat. Texas Hills Country festivals are abundant in the summer where you’ll find shopping, dining and entertaining festivals dedicated to everything from the mosquito to watermelons. Average temperatures are in the 90s with high humidity, so you’ll want to drink lots of water and take time out of the sun. Schlitterbahn Waterpark in New Braunfels is one of the first family waterparks located within the city limits. Float the Comal River, a true Texas past time, to experience the “longest shortest river in the world.” Get on the water at Lake McQueeny and Lake Placid, two reservoirs on the Guadalupe River south of New Braunsfeld where you’ll find opportunities for swimming, boating, and fishing. Fall is the second shoulder season in Texas with colder temperatures and less humidity than in summer. Don’t miss the Texas State Fair spanning three weeks and featuring carnival rides, outrageous fair food and tons of family-friendly activities. Popular outdoor activities in autumn include cycling, golfing and visiting the many outdoor locations in the region. Fall temperatures in Southern Texas average around the 70s and 80s but will drop into the 60s close to the end of the season. Packing during this time can be more difficult, so bring additional layers or pick up a souvenir sweatshirt at one of the many quaint boutiques in town. Fall is the perfect time for a denim or canvas jacket for cool evenings. Winter weather in News Braunfels is cooler, but many still come to escape cold temperatures in other parts of the country. Temperatures are often in the 50s and 60s throughout the winter months but are known to occasionally drop below freezing. Long-sleeve layers and light sweaters are ideal this time of year. Down jackets are also packable and lightweight, so not to weight down your suitcase. Stop by the largest known commercial taverns in Texas at the Natural Bridge Caverns, or stroll the 51-acre riverside park for family-friendly activities. A must visit is the San Antonio Livestock Show and Rodeo to help make the season truly memorable. Each season in News Braunfels offers unique opportunities to explore the beauty of Texas Hills Country. Don’t miss the exclusive vacation rentals from New Braunfels Resorts ready to welcome you year-round. Plan your dream vacation today!